Replace your old surfaces and upgrade to a new design when you choose our expertly crafted hardwood flooring. Finding the right hardwood flooring for your home has never been easier with our wide selection of options that consist of different styles, colors, finishes, and grains. Peruse our expansive collection and find stunning new floors for your dining room, living room, or kitchen. From hickory and maple to cherry and oak, we carry it all so that you can enhance the elegance of any room in your home. 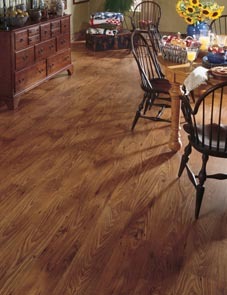 Our large inventory includes both engineered and solid hardwood flooring options. Your choice of hardwood floors depends on a few factors, such as the style that you want and the area where the floor will be placed. Speak to one of our hardwood flooring experts to determine which type of surface covering would be most suitable for your property. If you desire a luxurious design for your property at a price you can afford, engineered hardwood may be the choice for you. This style leaves more money in your wallet at the end of the day, and it lasts for many years because it is made out of durable layers of material. Equip your floors to handle heavy foot traffic day after day when you order our tough engineered hardwood flooring. This material also supports the green movement by offering eco-friendly options for your home. Protect the planet and your property while meeting your design budget when you order our well-made hardwood floors. When you are looking for a great way to add value to your home, engineered hardwood serves as an excellent style upgrade. Whether you want smooth, sleek wood flooring that adds a sophisticated charm to your living room or distressed wood for a rugged-looking home office, we offer a number of design options. Our showroom is stocked with stunning samples that show off such high-quality brands as Armstrong®, Mohawk®, and Shaw®. Complement your furniture, décor, and fine art with our solid hardwood flooring for a timeless look. This traditional wood flooring adds a charming style to any type of home, including contemporary, modern, craftsman, Victorian, or bungalow. Solid hardwood differs from engineered hardwood in that it is made out of a single piece of wood. Enjoy an authentic and natural-looking design in your home when you order our solid flooring products. As long as you provide the proper care and maintenance, our hardwood floors can be passed down from generation to generation. Make our rustic surface coverings a part of your family’s history that you can share with anyone who comes through your front door. Give your home a distinct style personality when you choose our property-enhancing hardwood floors. With our store’s large selection of flooring in different sizes, edges, and variations, the design possibilities for your home are endless. Consider our detailed wood flooring when renovating any room in your home. To help you make a style selection that you will love, our flooring experts provide one-on-one service and answer all of your design questions. Share your style ideas and preferences with us so that we can recommend a custom design. Backed by comprehensive inventory and industry training, our staff has the knowledge and experience to help you find the best engineered or solid hardwood flooring for your home. Reap the benefits of high-quality craftsmanship when you hire our professional team for your hardwood flooring installation. In order to ensure longevity of your surfaces, it is important that your flooring is installed properly. Leave your floor’s placement in the hands of our highly trained installer so that you can enjoy flawless and long-lasting results. We pride ourselves on offering you a prompt installation so you do not have to spend time and resources searching for a contractor. From start to finish, our team is with you every step of the way to bring beautiful hardwood flooring into your home. Our professional hardwood flooring installation is also backed by industry-leading warranties. Come to our company for the best installation rates in town. We pledge to offer you a level of personalized service that is unmatched by any other home improvement center or flooring store. Rely on our flooring specialists to do everything in our power to earn your trust, business, and recommendation to your friends. Contact us to breathe new life into your residential property with our stunning hardwood flooring. We are proud to serve customers in Ankeny, Saylorville, Bondurant, Altoona, and Elkhart, Iowa.